"Busy Week Preparing For Winter In The Northern Forest!" It was a very busy week here preparing for Winter and the upcoming Racing Season. Due to a rainy/warm week, it was the perfect time to do some house keeping here before the onset of Winter. Cecile found a good used freezer on the internet and we went to pick it up on Tuesday. At the same time, while we were in Joliette, we picked up another eleven weeks supply of dry dog food. On the return trip we stopped and visited our good friends Valerie And Laurent Gonsolin in St. Zenon. 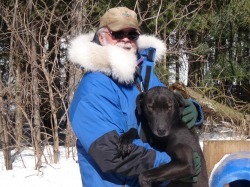 Thursday, we went to Montreal to pick up Taisa Kushner who will be staying here for the balance of the season to follow her interest and passion of Mushing. After which we also completed our monthly shopping of human food for a month and 35, 40lb blocks of frozen turkey and chicken skins for the dogs. Friday, we leveled the ground in the kennel and filled in all the dogs work of escalation during the off-season. Both Taisa and Cecile had an opportunity to spend some quality time in the kennel with the dogs. As mentioned earlier, due to warm/humid conditions the dogs have not be run this week. However, conditions look good for tomorrow and the following week to return to training. Welcome aboard Taisa to the Miortuk Team, Cecile and I look foreword to your participation here.